This upcoming Father’s Day will find life changed here. Unless you follow my personal blog, you may not know why I’ve been much quieter lately. Granted, I go for stretches without new updates but this one has been out of the ordinary. On March 17th this year, my Dad suffered a disabling stroke. He’s in rehab and probably will be for some time to come working on recovery. If you’d like to read the longer version of all this, there are two posts on my personal blog that go into more detail. I’m sure I have lots of news that’s art related but I’ll let that wait for another day. Right now I wanted to share a new piece of art I finished in time for Father’s Day. 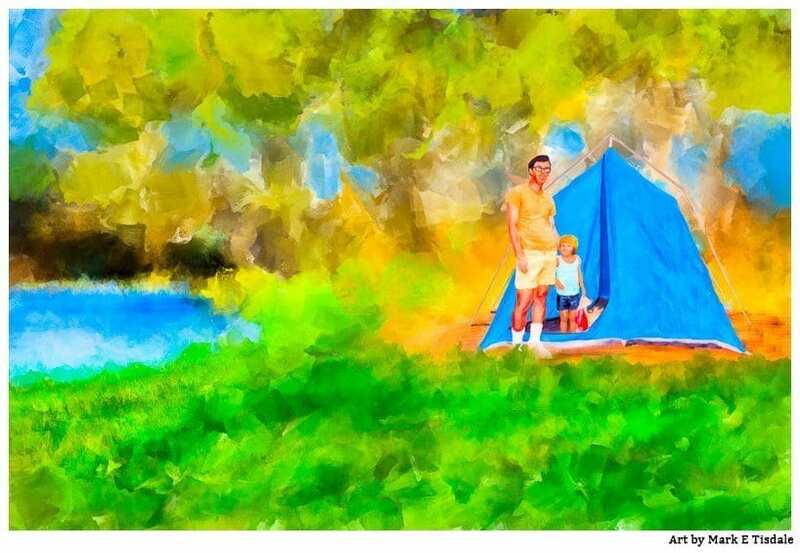 It’s much more personal than a lot of my work in that the father and son depicted in this camping scene are actually me and my father. When I was little, my Mom, Dad, and I would go camping every summer. The locations varied a little but a fixture on every summer schedule was Open Pond in the Conecuh National Forest. I have some happy summer memories from those trips. Between fun spent camping and seeing the general area where my parents grew up, these were always special trips. In fact, this artwork is based not just on my memories but a faded photograph my Mom took of me and my Dad setting up the tent on one of those long-ago trips. I have to admit it was really strange depicting myself, even at a younger age. I was never quite satisfied with my face, but that may show some deep-seated insecurity on my part! But overall, I love the end result. It speaks to me and I hope my Dad will enjoy it as a father’s day gift. I also hope that maybe others out there will identify with this scene and it may help them recall their own happy summer memories with their fathers.